Joomla email not showing up correctly. ‘); document.write(addy837); document.write(‘<\/a>’); //–>\n “>the email address. I found a thread about turning off email cloaking. This issue stemmed from “System – AntiCopy” plugin that was installed. I needed the plug-in so the cloaking had to be disabled. Joomla template won’t install says template.css already exists. In upgrading a Joomla 1.5 site to 3 the updated template won’t install. Turned out I added a newer <css> tag and didn’t get rid or the old link to the css in the <filename> tag area. As always I hope this helps someone else. 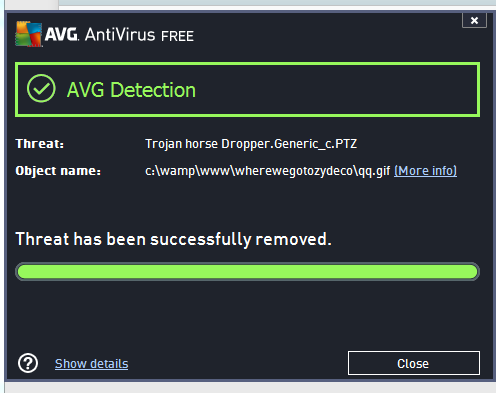 While installing a joomla 1.5 site locally AVG popped up with a virus found. It appears to be a “.gif” that is wrapped or renamed. It caused the website to not save content when it was being added or updated. I found the file in the root of the Joomla install and also in the /images folder. It looked like this. Solution: AVG quarantined the tojan and I upgraded the Joomla install to version 3. I found more info on the virus here.